As we age, vision problems tend to increase. Issues that at first need just a modest corrective lens can grow over time to require a much stronger prescription. This doesn’t necessarily pose a problem, but strong prescriptions have one obvious drawback: they need to be made from lens materials that are increasingly thicker and heavier than the weaker prescriptions you might have enjoyed in the past. 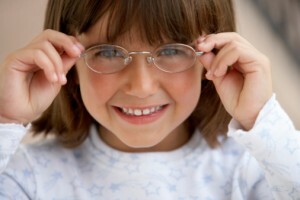 Thick lenses, whether made from glass or plastic, also tend to distort the look of the eyes. Depending on your prescription type, they can magnify your eyes or have the opposite effect, making your eyes and orbital areas seem small in proportion to the rest of your face. If you find yourself requiring lenses that are prohibitively thick, heavy, and/or distortive, the answer may lie in the utilization of high index material. High index glass or plastic requires less material to create even strong-prescription lenses, thereby reducing thickness and weight. And with that reduction goes the look of distortion. The most commonly used rating in the high index range is 1.74. 1.74 high index material is the thinnest and flattest available for prescription glasses. Lenses made with standard plastic (which has an index rating of 1.50) will be almost twice as thick as 1.74 high index lenses cut to the same exact prescription. Even when compared to other high index material, such as the 1.67 high index lenses, 1.74 rates favorably, producing lenses that are approximately 13% thinner. The benefits of this lighter, thinner material go beyond a mere reduction of the distorting effects of a high prescription. A 1.74 allows the high prescription-wearer unprecedented choice in style and fashion. Frames that you thought you’d never be able to wear, those with sleeker profiles or thinner styles, can now be yours with a 1.74 high index lens. Your local optometrist or optical lab will be more than happy to order your glasses made with 1.74 lenses…for a price. That price might seem prohibitive, as it involves the usual expenses associated with brick-and-mortar business: overhead, advertising costs, the ordering and storage of material. If you’d like the same 1.74 lenses for a greatly reduced price, shop online at Myeyewear2go.com. Our fully-equipped, state-of-the-art optical lab can produce the same lenses any optometrist can, without the mark-up for the above expenses. If you’ve put off enjoying the benefits of 1.74 high index lenses due to price, visit us to “see” what you’ve been missing.